Subtropical plums are cultivated on limited scale in the plains of north-western India. Although the fruit quality of plums produced in the subtropical climate is poor,still these fetch a high price in the market because of its early availability. It is available at a time when the competition from other fruits is the least. Punjab is a leading state for cultivation of sub-tropical plum in India. 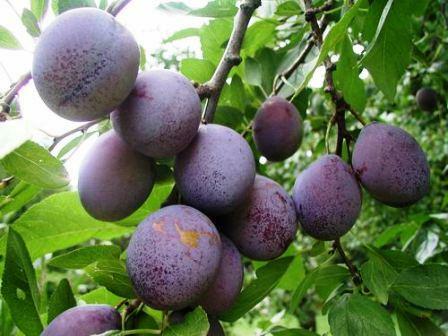 Plum is not very fastidious in its soil requirement and can be grown with success on a wide variety of soils. However, heavy textured soils which can retain moisture are best. Heavy clay remaining water logged for longer periods or coarse sandy soils that dry out readily during summer should be avoided. Deep, sandy loam soils with good drainage, free from alkaline and saline conditions are ideal. Plums generally require more chilling (300-1,000hr) than peach and almond. These are generally grown in the low and mid hill region. Cool winter and warm summers are suitable for its successful cultivation. A few varieties of Japanese plums also grow successfully in the sub-mountain tracts of Punjab and Haryana. Its fruits are quite large, bright crimson with thick flesh, possessing excellent shipping quality. They ripen in the second week of May, their average yield being 30kg/tree. Since this variety is self-incompatible, it should be planted with variety Kala Amritsari. It is most popular cultivar grown in Punjab; its fruits are medium-sized, round and dark brown at maturity. Flesh is yellow, moderately juicy and excellent for jam-making. Self-fruitful, its yield improves if pollinated with Titron. The fruits ripen during mid-May, the average yield 40-50kg/tree. It is a self-fruitful variety. Its yield improves if ‘Alucha Early Round’ is planted as pollenizer. 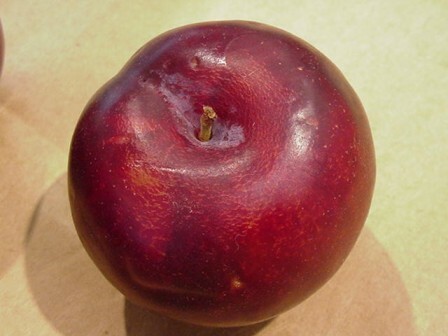 Fruits are medium-sized with deep purple color and thin skin. Since its flesh is yellow, it is excellent for jam-making. The fruits ripen second week of May, the average yield is 25-30 kg/tree. Fruits are small –sized, dull yellow, thin skinned with soft melting flesh. They ripen during April-end and yield about 28kg/ tree. This is partially self-fruitful variety but its yield improves if pollinated with ‘Kala Amritsari’. Fruits are large, purplish with creamy flesh. They are good for jam and squash –making. It is a self-unfruitful variety and should be planted in rows alternating with those of ‘Howe’. Fruits are large, yellow colored occasionally tinted with red. Pulp is juicy and sweet. Fruits are large, round, sweet juicy. They become red at maturity. They ripen in second fortnight of May, the average yield being 30-35kg/tree. Using Alu Bokhara as pollenizer is helpful. Fruits are round and small. They develop red color at maturity and ripen in second week of June, the average yield being 25kg/tree. Fruits are rounding, medium-sized, sweet and juicy. They become limon-yellow at maturity and ripen in the first fortnight of May, the average yield being 25kg/tree. Fruits are small-sized, dark purple. They ripen late in the season. Since trees are self- incompatible, they may be planted with that of Titron. This is somewhat shy-bearing variety but its fruits have a good-keeping quality. Fruits are black with relatively thick skin. Fruits are medium-sized, round with thick skin, yellow and juicy. They ripen in first week of June, the average yield being 40kg/tree. Plums can be propagated successfully on peach, plum and wild apricot rootstocks. For light soils use of peach rootstock is recommended, whereas for heavy soils, plum Kabul Green Gage cuttings or apricot rootstocks give better results. Rooted cuttings of Kala Amritsari can be used directly without budding. For this stem-cuttings are prepared in the first week of December an after callusing for about a month they are planted in field at a distance of 15 cm x 30cm in January. The rooted cuttings can be used directly or budded in May-June or cleft grafted during December –January. For raising rootstock, like peach, plum (Desi) seeds are sown in November. They germinate in spring and seedlings are allowed to grow single stemmed. The seedlings of pencil thickness are budded during May-June. Shield or T-budding gives good results. Rest of the seedlings can be bench grafted during December-January. After the scion has grown for one year, the plants can be planted in the field in winter 6m x 6m apart from row-to-row and plant –to-plant in square system, accommodating 275 trees/ha. Plants tree should be trained according to modified leader or open centre depending upon growth habit of the varieties. Many varieties of the Japanese group having a spreading habit are better adapted to open centre of training, whereas upright –growing plums should be trained to modified leader system. After four years of planting the leader braches modified and 4-5 well spaced secondary branches are obtained. Since plum bears fruit on one-year-old wood and spurs on older wood, only light pruning is given to bearing trees in January to encourage new growth and healthy spurs. 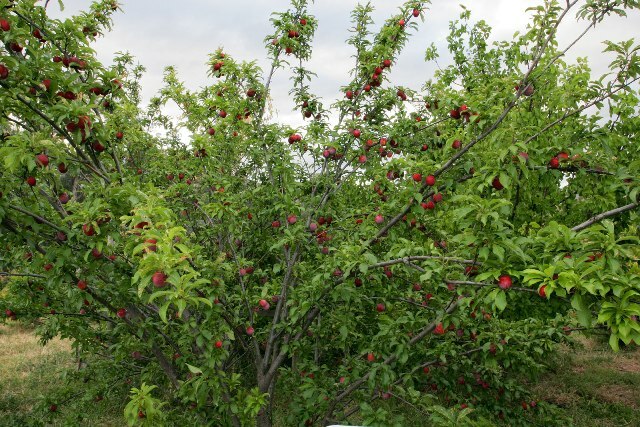 a certain amount of thinning of branches and opening of the top of the tree is necessary to admit enough light for development of spurs and better fruit color. Water sprouts which grow on the trunk and main braches should be removed regularly. The dose of fertilizers varies with the type of soil, age of trees and management practices. Sandy soils require more fertilizer than heavy types. However, a dose of 6 kg farmyard manure, 60 kg urea (30 g N), 95g super phosphate (15g P2 O5 ) and 60 g potash (36g K2O) /year age of the tree is optimum to meet the nutrient requirement of plum. After sixth year, the dose should be increased to 36kg farmyard manure, 360 g urea, 570 g super phosphate and 375 Potash. Subsequently the same dose may be repeated. Farmyard manure as well as P and K should be applied in December. Half of N should be applied in spring before flowering and the remaining half one month later. Sometimes deficiency of Zn is observed in plum growing on sandy soils during summers. It can be corrected by foliar spraying of three kg zinc sulphate, 1.5 kg unslaked lime in 500 liters of water. Most Japanese plum cultivars are either self- unfruitful or partially self –fruitful, requiring cross- pollination. They set heavy crop, if interplanted with other cultivars. Therefore, it is recommended that at least every third plant and in every third plant and in alternated wit 1or 2 rows of pollenizer are desirable when both are commercial varieties. Another alternative is that 10% plants of the pollenizer variety should be randomly distributed in the orchard. Short-statured, shallow-rooted leguminous crops—greengram, blackgram, pea and cluster bean—can be sown as intercrops during the non-bearing period of the trees. Some plum cultivars particularly those of the Japanese group overbear, requiring judicious fruit thinning. Thinning should be done by hand before the pit-hardening stage and fruits should be spaced 5-8 cm apart. A number of weedicides can be effectively used to control wide spectrum weeds in plum orchards. A pre-emergence application of Diuron (4 kg/ha) or Terbacil (3kg) or Simazine (4kg/ha) is recommended. Post-emergence application of Grammoxone @ (2 liter/ha) or Glyphosate (800ml/ha) is very effective. Plum trees must be given sufficient water during March-May depending upon variety to induce new growth, flowering and fruiting. In subtropics, plum trees require highest amount of water during April-May which coincides with the rapid fruit development period. There should be no water stress during this period. Since plums are very delicate and perishable, they should be packed with care. The optimum maturity standard varies with cultivar and intended use of fruit. For local consumption they should be allowed to ripen on the tree, but for distant market they should be picked at the color –break stage. Since all fruits do not ripen at the same time these, should be harvested in several pickings. Fruits are kept in baskets or buckets padded with liners. The fruits should be picked along with their stems. After grading fruits are packed in shallow containers about 10-12 cm deep. Packing should not more than three layers deep. After packing fruit should be cooled immediately to 0`C which stop the ripening process for 12 days. Plums can be stored at -2`C for 45 days without any adverse effect. However, plum Kala Amritsari and Satluj Purple can be stored for 55 and 30 days respectively at 3.3`C and 85-90% relative humidity after treating with 10ppm GA and 1,000ppm CCC.